last week i bought a Yamaha PCY-155 and would like to share the results of my tests. Out of the box it can be used as a 2-zone crash. With some minor modifications it can also be used as 2-zone ride or hihat. As far as i know the PCY-135 uses the same circuit board. So the following descriptions should also match for that. The cymbal has a piezo wired to the tip of the TRS jack. In addition there are 3 switches wired to the ring of the TRS jack. Two to detect edge hits and the third to detect bell hits. The switches at the edge are in parallel and have a series resistor. This resistor is used by Yamaha modules to differentiate between edge and bell. 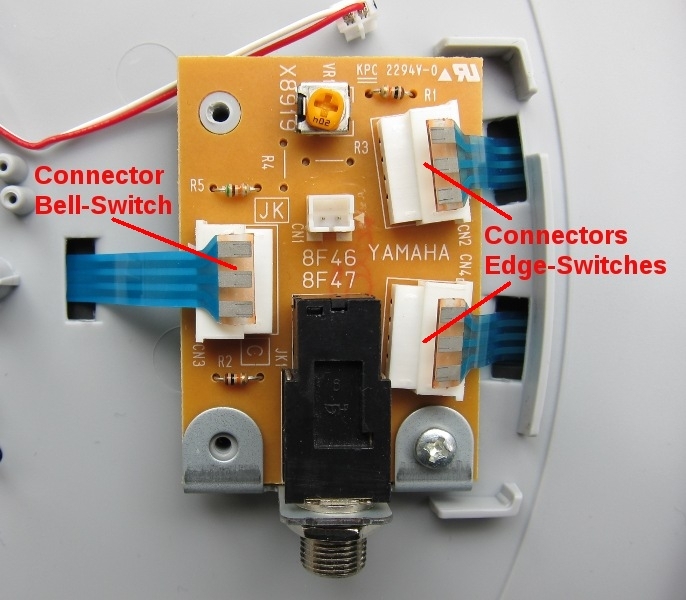 The 2Box module can not detect the difference between bell and edge switches so bell and edge will trigger the same sound. 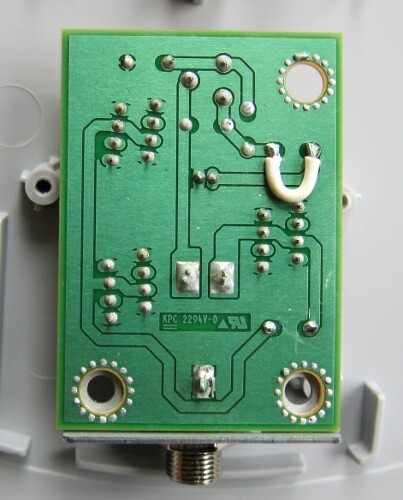 Directly connected to the piezo is a voltage divider (two resistors and a potentiometer) to lower and adjust the output signal. The cymbal can be used out of the box as a crash with 2 zones (bow, edge) and choke. Recommended trigger type is "CyEdg". You can also try "Cym12/14" but these are made for the 2Box cymbals with 3 zones. Depending on the gain setting you might have bell sounds somewhere on the bow when using "Cym12/14". Thats why i recommend to use "CyEdg". 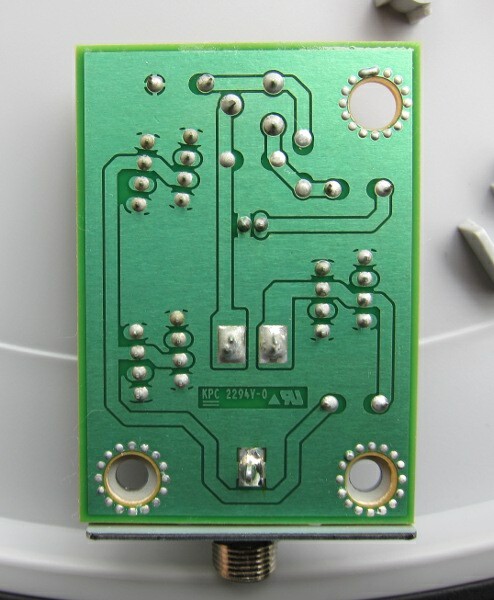 To use the Yamaha cymbal as a Hihat you need an additional circuit board for the level detection. 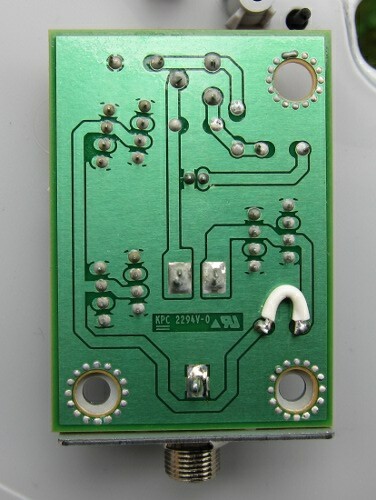 This can be either the original board taken from the 2Box hihat or the adapter board which i posted in the other thread. There is also a small modification at the cymbal required. In order to have both zones at the hihat (bow / edge) you need to bypass resistor R2. This can be done by soldering a wire between the pads of this resistor. Of course a 15" cymbal is pretty large for a hihat but it works also with a PCY-135. This was already tested by espen. If you already have set the output level of the cymbal to maximum but still need (too) high gain settings at your module you can increase the output voltage by bypassing resistor R5. To bypass the resistor you can solder a wire between the 2 pads of this resistor. Afterwards i recommend the following procedure to setup the output level. Is there any difference if you youse this pad in comparison to the PCY 135 Cymbal Pad used as a hihat? Hi Manfred, just want to congratulate you on another useful and detailed post, great work. + 1, same here, thanks for sharing! I'd like to purchase one of your boards for the hihat modification. I have a yamaha pcy135 and will be using it for my hihat. What is the procedure for purchasing them. Thanks Manfred. Very useful ! Has anyone ever tried to put the bell switch CN3 in parallel with R5 ? Would this make the cymbal 3-zone with cym12/14 setting. is there no way to make this a 3-zone cymbal? Hm, trying to learn about this stuff. So where is the piezo in this one located? My thinking: If you disconnect the bell switch, and then relocate the piezo to the bell and use the cymbal with cym12/14 settings, wouldn't that make it work as a 3 zone cymbal? Piezo is located in the box where connector is. 2box cymbals are using a ring piezo in the bell so it triggers 360 degree. If you put a standard piezo in there, you will probably need to hit accurate but in theory it should work. hm can i buy a ring piezo somewhere? or maybe put four, or eight regular piezos in a ring?